He bought me a hamster last week. I’ve been going on and on whether I want to get a hamster or not. 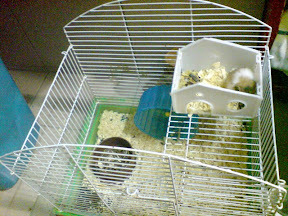 I had two hamsters before and one of it died – kena bully by the bigger hamster – and the other one escaped. Plus they were not tame and always bite. So i’ve been debating about it for a few months now and finally he said, “If I get one for you, you must take care of it ok?” Yey! So we went to Pet Safari in Ikano and went to look for one. I actually wanted to get a dwarf or robo hamster because they are smaller and cuter but they tend to bite and I don’t want to hamster that bites. So yea, he got me a hamster. 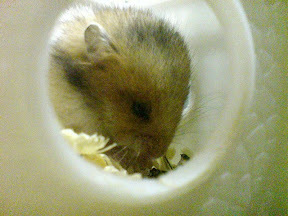 Its a female Golden Banded Syrian hamster. Its quite young tho, only a few weeks old. Thats why it looks so small. Im thinking of getting a new cage because the current one is kinda small for a Syrian hamster (once it grows to full size) and its rusty. huhu~ gile lama i xbela hamster..
the last time dari 2 ekor sampai 9 ekor jadi beranak2..
hohoh bayi hamster seperti piglet..
mende ni dah besar nanti jangan makan pulak.